Secure On-Line Ordering System and unconditional money back guarantee! 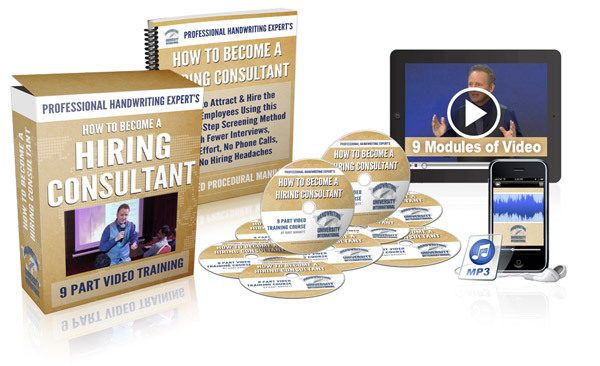 Personal Coaching & Consulting to help build your handwriting business. Order 100% Risk Free. Not only is our shopping cart secure, but all our products carry a FULL ONE YEAR MONEY BACK GUARANTEE! Feel secure ordering from us. Call 310-684-3489 for customer service or to place your order via telephone. "I find your products to be of top, top quality. I wish everyone did business your way. Thanks for the great courses! I've been thrilled with everything I've purchased from you!" 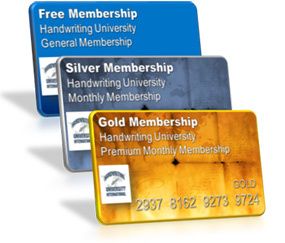 Handwriting University's newsletter is free. Remember to subscribe to the newsletter and a weekly video or article in your email in box. 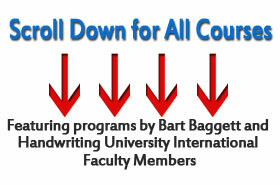 Most articles written by Bart Baggett and the International Staff of Handwriting University. 100% opt-in & spam free. Sign up separately for access to the online membership site, which can be accessed totally using this link, or upgrade to a premium membership access. Sign up for the membership site here and browse past articles or join a live class. Level 101 DVD/CD Handwriting Starter Kit. Click here for full product description images and samples. The entire 101 book (PDF) and shipped to your door. Digital version of the Grapho-Deck and shipped to your door. PRICE: $197 (INSTANT 100% Online Access). Level 301 Standard Certification Level Course. Certificate & Private Mentoring. This is the new 2019 online course with some learning tools/ textbooks shipped to your door. If you own level 101 or 201 and you are ready to upgrade, please get instant access to the entire online certification course. All students get the textbook shipped to your door and instant online access inside the new completely revised video interactive online training. Full Standard Certification Home Study Course (New students) Self-Study. 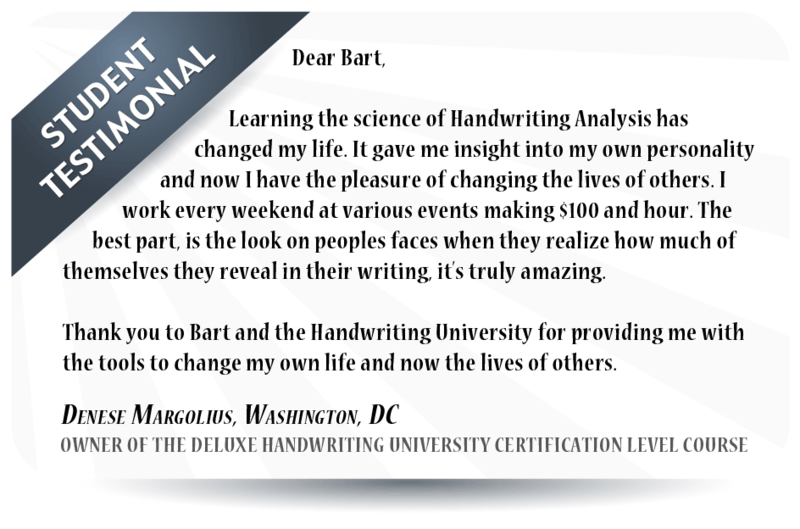 Special Price includes all of our most essential handwriting analysis courses and prepares you for certification and a career in this field. Add a Mentor for just $1200 more and get one on one tutoring. We will assign you a personal mentor who will guid you through all modules and help you get prepared for the final exam. 3 Modules as of December 2019... all updated! 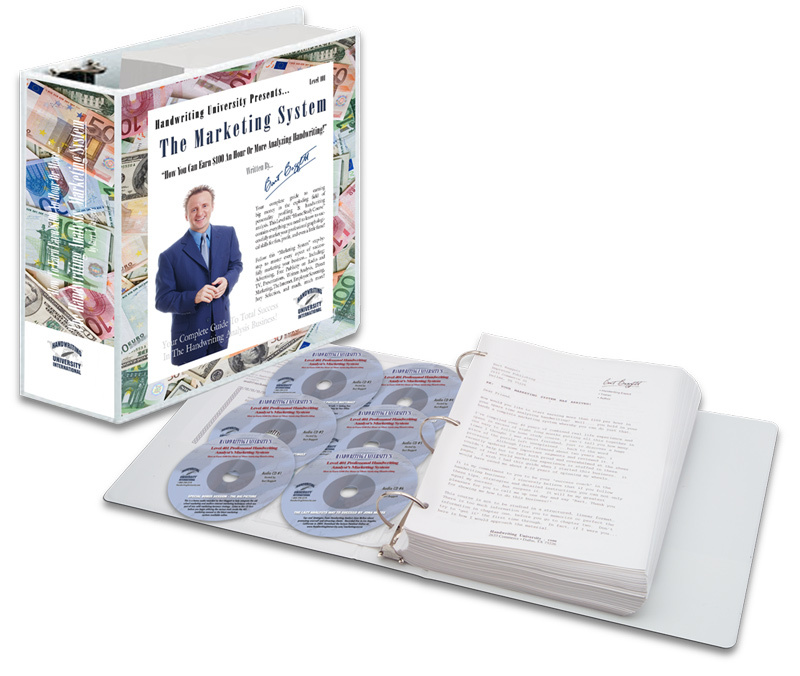 How To Make $100 Per Hour Analyzing Handwriting Marketing System included the 300+ page 3 Ring Binder of marketing tools, flyers, spreadsheets, and instructions. It also included full access to the Grapho-Web2.0 online written report generator and 5 Audio CDs and the two new modules shown at the left which help you become a professional speaker and consultant. Retail $2799 instant online access. Read about the Handwriting Marketing System in detail here, online. 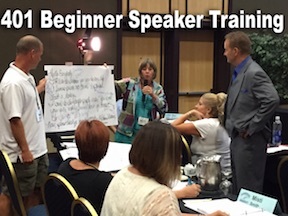 Did you know there is a 10 payment option if you are also part of the Marketing Mastermind community and desire to become an Authorized Trainer in the next few years. Click here for the 10 month payment option. This course is the latest scholarly information relating to all kinds of "advanced trait stacking" which will expand your knowledge far beyond the basic traits and basic personality profiles. Because this course contains hard-to-find traits, controversial techniques, and even cutting edge "research" regarding health, mental fitness, and career profiling, this course is only for sale to "certified students" or students who are in the final stages of getting their "certification." 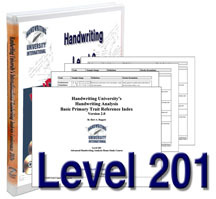 This is course is also a necessary pre-requisite to become an Authorized Trainer for Handwriting University. 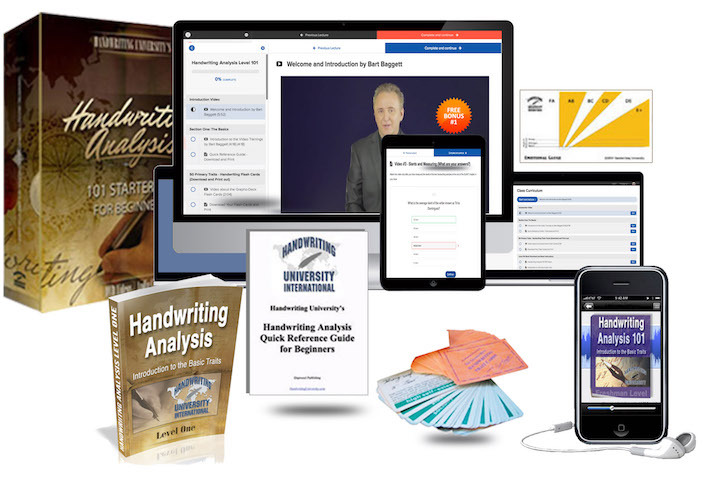 This course will fill in the gaps of knowledge, clear up any confusion, and explain in vivid detail any expectations and errors you might have been making using basic graphology principles. The concepts and strategies of stacking traits is so powerful that you will wonder how you ever analyzed writing without it. 20 + hours of seminar video! 26 Videos in all on 11 DVDS. Only the audio of this course is online. All the videos and text books are shipped on DVD. Perfect for man of any age who wants to be more like James Bond and less like an insecure boy when it comes to women, career, sports, and life. "The power to control my inner voice, manage my emotions, and actually choose my personality traits has been the greatest gift anyone could have ever given me." 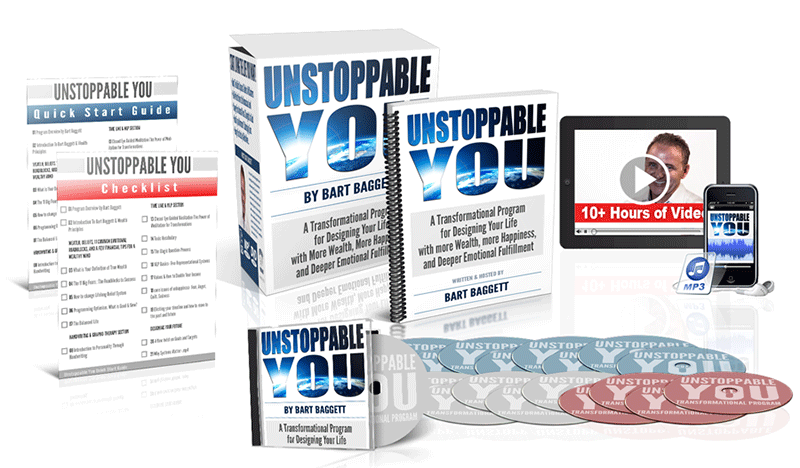 Are you ready for Unstoppable You - A transformational program for designing your life with more wealth, more happiness, and deep emotional fulfillment? Now, here are some of our best selling programs sold separately. Now you can have one-on-one "private" coaching sessions with Bart Baggett. Sessions are 55 minute in length and recorded in mp3 format for you to listen to afterwards. You are encouraged to send in your handwriting sample and fill out the application before the first session so your time used in an effecient manner. You can ask ask personal or business questions during your time. Multiple sessions are available and we encourage you to book at least 2 weeks in advance. If you awriting a book or launching a business, you might want to consider a monthly meeting with Mr. Baggett in the form of a long-term career coaching agreement. 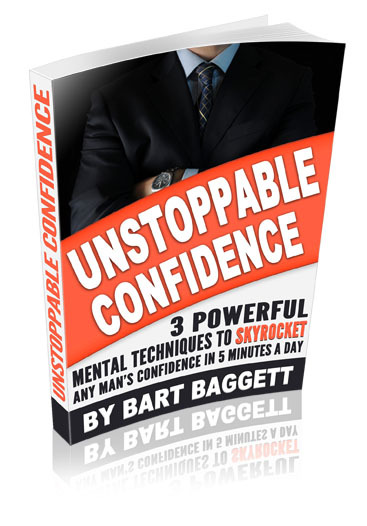 When you that, Mr. Baggett becomes your "business strategist" bringing you winning strategies, profitable campaigns, high-paying lectures, and you will even write and publish a book. Clients are accepted on an interview basis. Read what others are saying now. New! Bart Baggett's latest book reveals the psychological "Success Secrets of the Rich and Happy." It is available now in INSTANT DOWNLOAD from anywhere in the world with no shipping. This will be the most important book you read all year! Only $19.99 and includes a free audio bonus. 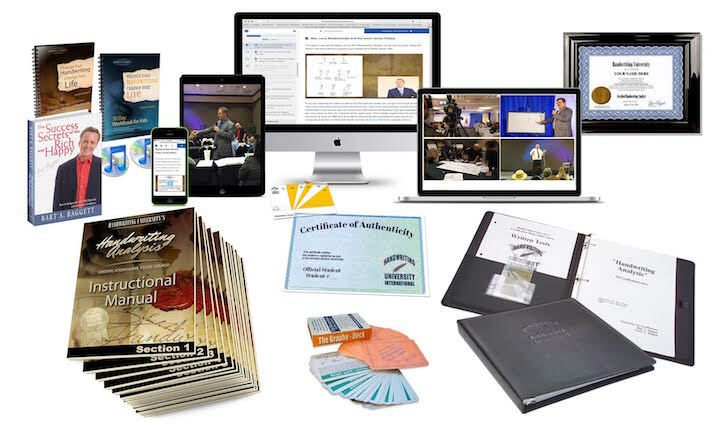 Over 435 pages of NLP, handwriting, psychology, financial strategy, and so much more. Because this is an Instant download, you will be asked to check out on a special secure page. You can order the paperback, the PDF version, the Amazon Kindle Version, or soon the Audio Book. If you order the PDF version, you can be reading it in the next 10 minutes (print it out or read it on-line). 51 Easy-to-use instructional flash cards with separate personality traits illustrated on each card. Fun, simple, accurate and portable. This is Bart Baggett's all time best seller! Each deck of cards comes with a 40+ page instruction manual as a special bonus! This is a perfect companion to the Change Your Life Workbooks or the Success Secrets of the Rich and Happy. Audio Book Included as a free bonus for all book buyers on this site. "What if an author provided the missing piece to make the law of attraction work for you? This book brilliantly guides the reader through the art of asking the right questions in every area of your life. 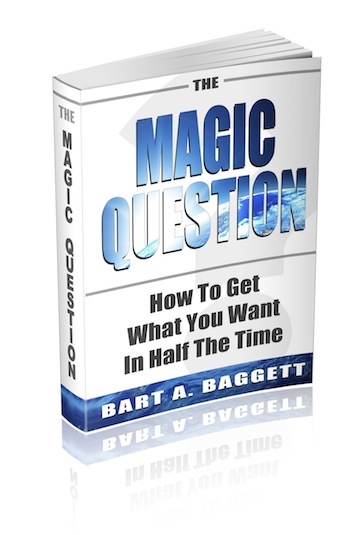 Author, Bart Baggett provides questions that re-frame your thinking about your finances, career, relationships and spirituality. The framework he has developed is backed by brain science over the past 60 years, as his references show. If you like books by Wayne Dyer, Louise Hays and Esther and Jerry Hicks, then this book is for you." The Magic Question might sound too good to be true, but it's based on sound brain science and advanced linguistics. Best of all... it's easy to read and filled with fun stories. It has nothing to do with more effort, visualization, or even goal-setting, but can serve to powerfully enhance any of those things. It's about shifting your mind in the direction of happiness, success, and optimism... using the power of one question a day. Audiobook Download (Free Gift for Buyers) 2 Hours. Read by the Author. 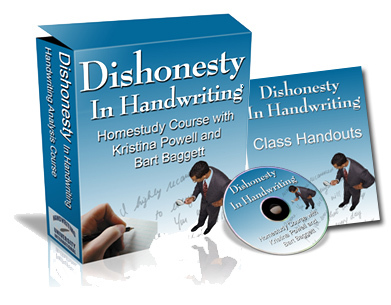 Dishonesty in Handwriting - Just released for the Brand New Handwriting Analysis Membership Site. Read about the course here ! 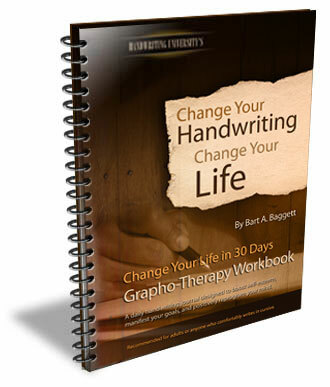 Adult Change Your Life In 30 Days Grapho-Therapy Workbook w/Instructional MP3. ***Adult book has been redesigned from inside and out. New versions are now shipping worldwide. If you do not have this cover on your book in your local campus, please report your distributor to our worldwide headquarters so he/ she can get current on the versions. 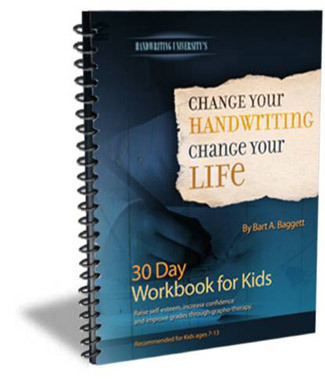 Kids Change Your Life In 30 Days Grapho-Therapy Workbook w/Instructional MP3. This book recommended for kids ages 4- 11 instead of the adult workbook because the middle zone lines are larger and the questions are simple. The adult workbook is a journal with college rule lines and sophistated questions. *Order extra kids book at this discounted price of $17.50 as part of the Teacher's Kit. This is the best value. Save Over $30 if bought seperately. We recommend you order a Grapho-Deck with this course to easier explain the concepts to the children. This new "autograph" course is a breakthrough from two of the world's leading handwriting experts from Australia and America. Discover slight changes in your signature, that can change your life. Plus, this course is entirely downloadable, so you can get started right now! 304-page relationships book by Bart Baggett. 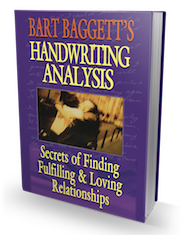 This is the most comprehensive handwriting/NLP book available, designed for a person to easily utilize these tools to improve their relationships or find their perfect mate. Includes a complete trait dictionary and lists the 10 hell traits. A classic, which is now sold in 17 countries, including China! PRICE: $15.95 $10.00 304-page PDF version, too. PDF version is available. The soft cover is no longer in print. It is being re-written for the 20th anniverssary re-release. Or Buy downloadable PDF only $10.00 - download book using PDF Adobe Acrobat Reader. Instant delivery just $10. Buy PDF version now. Before using our Secure On-line Ordering System, please read important Order Information about shipping, international orders, and alternative ordering methods. If you have questions about which specific product to order, feel free to call Handwriting University at 1-310-684-3489 Ext 4. Please place your orders using the secure on-line shopping cart below, but you are welcome to talk to us and get advice on which products to order. 1-310-684-3489 to order by phone. Our Course Information Specialist will take your order personally and ask your questions.